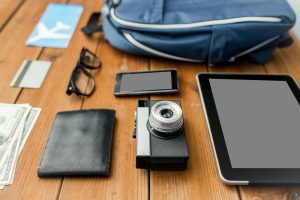 Gone are the days when frequent travelers for business and/or pleasure were in for a tedious, drawn out process of phone calls and prolonged research to book plane tickets, hotel rooms, and rental cars. Today’s travelers no longer need to make an appointment with a travel agency or rely on a tour operator to see the world. Rather, our devices, from our laptops to our tablets and smartphones give us the ability to make plans to see their world right at our fingertips. Travel has become a “do it yourself” (DYI) endeavor with travelers no longer limited to the traditional hotel for their accommodation thanks to companies such as AirBnB, which allow you to research accommodation available in private homes in cities all over the world, adding a truly homey touch to the travel experience. Feeling ambivalent about walking into an unfamiliar restaurant in a city you don’t know? Use the free hotel WiFi to research local options and go to dinner with confidence. These are only some examples of the way technology has transformed the travel industry and how we make our travel plans. In addition to being able to purchase airline tickets and make hotel reservations all by touching the screen on our smartphone, today’s travelers no longer need to wait in a long line to check in for their flight or into their hotel room. Rather, airlines allow passengers to check in online and access boarding passes right from their device. Going to a hotel? Bypass that line and pick up your room key right away because you checked in online in advance. Based out of New York City, Trivago is a company bringing ease and convenience to the process of booking accommodation. Using either Trivago’s website or free mobile app for your smartphone or tablet, Trivago allows the modern traveler to access information for more than 1.3 million hotels in over 190 countries. Users can even set up alerts personalized to their travel needs and receive messages about prices and accommodations via e-mail or text. Travel a lot for business? Look no further than TripActions, a company changing the way we travel for business. Via their TripActions membership, business travelers earn rewards for personal travel as well as upgrades on airlines and accommodations when they save their company money when traveling for business. As a result of changing technology; the travel industry is one that will continue to change and revolutionize. It will be interesting to see what advances come up within the next few years.